Do you or loved one suffer from allergies? Whether it’s dander from our 4-legged friends, dust build up in the home, or even pollens that trigger seasonal woes, allergies can be almost crippling. One way to help keep those allergens at bay is to invest in an Air Purifier. 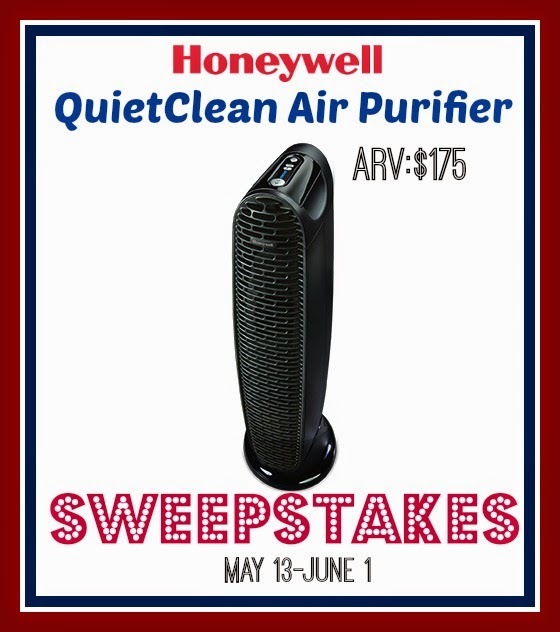 One great choice is the Honeywell QuietClean® Air Purifier. -Removes odors and VOCs for refreshing air. Brandy over at Newly Crunchy Mama Of 3 recently received a Honeywell QuietClean® Air Purifier to check out with her family. She definitely knows a thing or 3 about suffering from allergies! You can check out her full review HERE. I dont have much hair — i am bald, and my skin i use a lot of lotion in the summer.. I brush my hair a lot to keep it shiny & pretty. I keep my hair and skin looking great by trying to stay in the shade when lounging in the sun,I get burnt easy. I use more conditioner on my hair and lotion on my skin during the hot, dry summer months. I use coconut oil on my skin and hair. I use a scrub on my face every other day and moisture every night and morning. And I love to use Coconut Oil on my hair to keep it shiny and hydrated. I keep moisturized and protect my hair as much as I can. I have be honest and tell you that I don’t do anything special except use Dove hand soap and body wash. My mom always used Dove. I’m 57 now and I don’t have any wrinkles on me. Lots of grey hair yes, but no wrinkles. Keep my skin as clean as possible, and keep hydrated. I use coconut oil if my hair gets too dry otherwise I use Unwash products which are awesome!! I drink lots of water, moisturize and use sunscreen daily. I use aloe vera sometimes…. My comment won’t show up! Anyway last time, I use moisturizer on my face and condition my hair. Hi Nicole – your comment goes into moderation before showing up on the site. That is so that spammers don’t overload any posts. You should see it now. I find that during the summer I have to deep cleanse as well as moisturize both my skin and hair. I have to moisturize, moisturize and then have to moisturize some more during the summer. Both my skin and hair. I don’t do a whole lot. I just wash my face daily and use conditioner for my hair. I just make sure to use lots of moisturizer for my face and lots of conditioner for my hair.